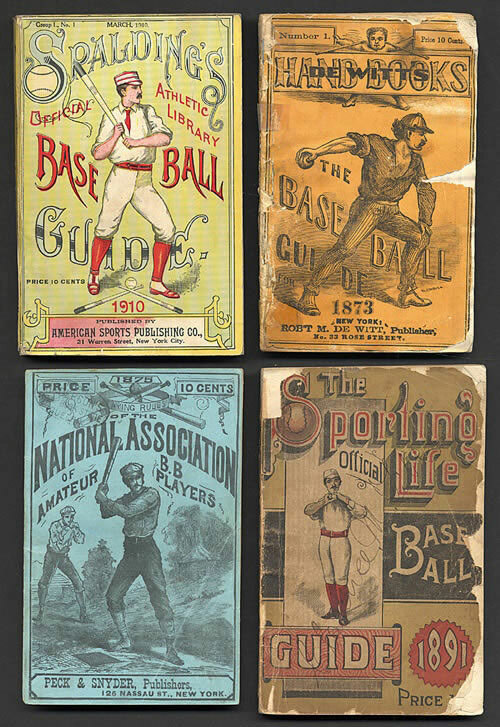 Although statistical based newspaper and magazine articles had appeared before, the first known baseball guide made its appearance in 1859: the Base Ball Player’s Pocket Companion published by Mayhew and Baker. In the 150 years that have followed, these annual baseball guides have been one of the most important primary sources for baseball researchers. What makes the guides valuable is that they compile an entire season’s worth of information into a single volume; standings, rosters, playing statistics, etc. For many seasons, these guides are the only significant record of minor leagues, amateur and semi-pro leagues, and other baseball organizations. They are an invaluable resource for researchers. Many of the early guides have been digitized and made available online. 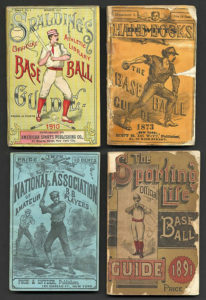 The Library of Congress, the Smithsonian Library and the Internet Archive are among the institutions that have posted collections of baseball guides. However, each of these collections has gaps. I have compiled this index to baseball guides available online, with links to each one. When multiple online versions of the same guide exist, I have linked to each one separately. I have added a number of new guides since this list was originally posted, and will continue to make additions as sources are found or newly digitized. Mark Aubrey has been particularly helpful in tracking down digital versions of may early guides.Thanks also to John Thorn, Carlos Bauer, and Caleb Hardwick for their contributions. I will continue to make updates as I find digital sources and digitize guides for the first time. Please note that most of these guides are in the public domain. In cases were copyright protection may still apply, I link only to authorized sources. I’ve also included a list of guides I know were published, but for which I haven’t found any digital versions online. If you have information on them or guides that do not appear here, please let me know via email and I will update this listing.